Whatever you score our love with, for a while it will be my favorite song. The Crayon Fields are an indie pop band from Melbourne, Australia that formed in 2002 while the founding members were in high school. The band's style draws influence from classic reverberated pop groups such as The Beach Boys and the Zombies. Members include: Geoff O’Conner (vocals, guitar), Brett Hudson (bass), Chris Hung (guitar, synthesizer, percussion) and Neil Erenstrom (drums). 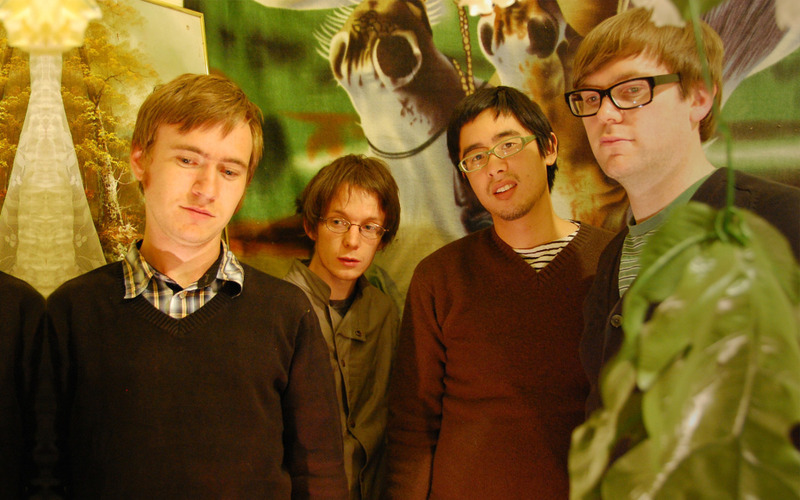 Animal Bells, their debut album, was released in 2006 on CD, MP3 and vinyl. Since then, The Crayon Fields have released a series of singles, 7” vinyl records and have toured extensively. Their second album, All The Pleasures Of The World (2009), has been featured on many blogs in the US and UK and has received airplay on US radio. The group's most recent release Make Peace With Love was released digitally on Bandcamp.com in 2010, and was supported by a US tour, which included a spot at the famous South By Southwest music festival in Austin, Texas. When you're a kid, one of the most satisfying things is opening a fresh box of crayons, inhaling the smell of wax and paper, picking out your favorite obscurely-named color (cerulean! ), and going to town on a coloring book. So it comes at no surprise that, with a name like the Crayon Fields, this Melbourne-based indie pop quartet creates songs that are intimately nostalgic. On their sophomore album All The Pleasures Of The World, “Mirrorball” serves as a dreamy opening track, wafting in like the first leaves of Autumn departing from their branches and fluttering to the ground in a flurry of burnt orange, red, and yellow. There's a hint of a 60s feel, inspired by bands like The Zombies and The Beach Boys, but lyrics like “You are still my mirrorball/I look at you and suddenly I'm a virgin in a dance hall” are a reminder that this band hails from the 21st century. “Voice Of Paradise” has lead singer/guitarist Geoff O'Connor attempting to seduce someone through his dulcet voice: “If all I can do is just try to entertain you/I'm lucky when you hear my song,” he sings. There's a slight tropical 70s feel, with a flute layered over bells and swelling strings, and it's hard not to get swept away in the gentle breeziness of the song. Just like the character of Joey on Friends had the ability to make anything sound dirty, O'Connor has the ability to make anything sound oh-so-sweet. On “Graceless” he sings, “I was graceless/I pooped myself like a prince,” and yet his gentle vocal delivery over shimmering instrumentation will still have you swooning. But nothing will have you swoon more than “Take Me Where The Light Isn't Cruel.” Layers of vocal harmonies intersperse with sweeping cello and violin arrangements (courtesy of Jessica Venables and her brother Nick, friends of the band). A Flamenco-inspired plucking guitar line fades in and out, giving the song a feel that will make you think you've known it your whole life. Although the band hasn't had a release since 2009, they're definitely worth paying attention to—whether you're rediscovering an old favorite, or listening for the first time.